Enrich your home with Alexa compatible smart lights and control them with your voice! You’ll see it is both useful and fun! Enjoy the experience! Imagine that you can tell your lights how you wish them to shine! If you are an Alexa owner, this is possible by changing traditional lighting with Alexa compatible smart lights. You can make different setups and create different programs depending which smart light you chose, so you can do it all by just ordering Alexa to dimmer or switch off lights in any room in your home. So, you don’t have to pause your favourite movie just to go to the children’s room to switch off the light. Check out our list of the best Alexa compatible smart lights and their features. We even have a surprise for IKEA products users, which you will find further in the article, and hopefully enjoy it! With the dedication to seamless smart home, Philips Hue products have been integrated within multiple smart home and home automation systems ever since they started with smart products. Philips Hue is considered on the top of the ladder of smart lightning and price follows high quality. But you can be sure that you will get what you paid for – excellent quality of lightning in your home. Philips Hue is compatible with Amazon Alexa, IFTTT and Z-wave and you can set your light mood depending on a wide range of situations and different factors. This is, however, a more expensive option than most of the others, but it has the whole automation system surrounding the lights. There a couple of other advantages of Hue, and first of them is the high quality of green light. The green light is one of the most significant issues considering smart lights, as it usually seems dimmed. But Philips managed adorable green by improving the Hue system. 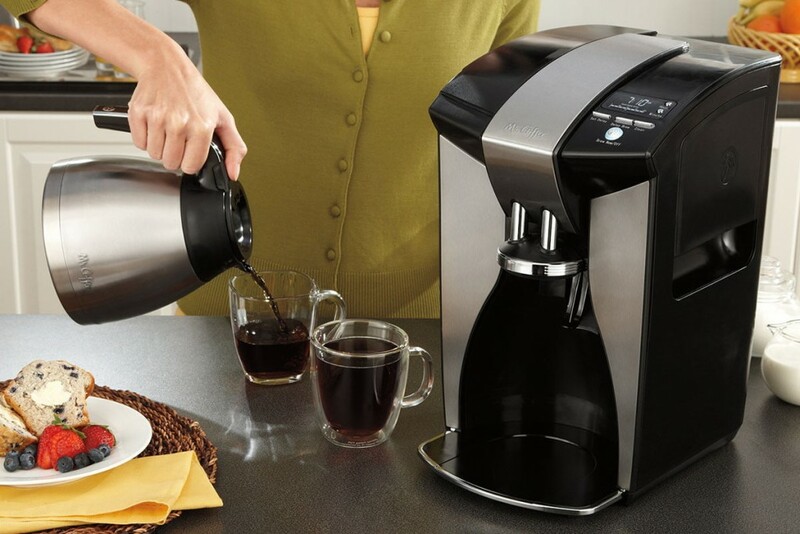 It also has a motion sensor that can be located wherever in the home. So you don’t have to walk into the dark house when you return home, or when your child goes to the bathroom at night, lights will turn on, and a kid will not be scared. If you wish to try a starter kit offered by Philips Hue, you can go with White and Color Starter kits in which you will receive three light bulbs and a hue bridge. After a test drive, you might want to add more light bulbs to the system, and the good thing of a bridge is that you can add and control up to 50 bulbs by merely screwing them in your existing lamps. Even though TP-Link might not be your first choice when we talk about smart lights, they provide smart lighting solutions that are the combination of proper pricing and quality. An additional plus is that you don’t need a hub, because you can connect TP-Link lights directly to the Wi-Fi router that you already use. Any type of TP-Link Smart bulbs is easy to set up. You just need to connect to the bulb’s Wi-Fi and then go through the setup process in the TP-Link Kasa app. This actually involves connecting the lamp to your Wi-Fi network. TP-Link’s Kasa app is used for all of the smart home devices of the company, which include smart plugs, routers, security cameras, and motion and door sensors. Within the Kasa app, you can dim the lights or set schedules for when the lights turn on and off. If you have colour-changing bulbs, you can have the colour temperature changed automatically based on the time of day. TP-Link has an Alexa skill, and you can control your lights by using your voice on your Amazon Echo. Any TP-Link smart bulb is also compatible with Google Assistant. TP-Link have three versions of bulbs: the Dimmable Light, which shines a warm white, the Tunable White Light, and the Colour-Changeable Light. 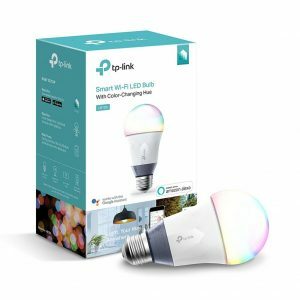 With all the features that TP-Link’s have and reasonable price, if you need only a few smart bulbs, you can consider these a good option. However, if you wish to replace a lot of bulbs at home, you might consider Philips Hue. It seems more expensive if you buy a starter kit, but single bulbs are much cheaper than TP-Link’s. 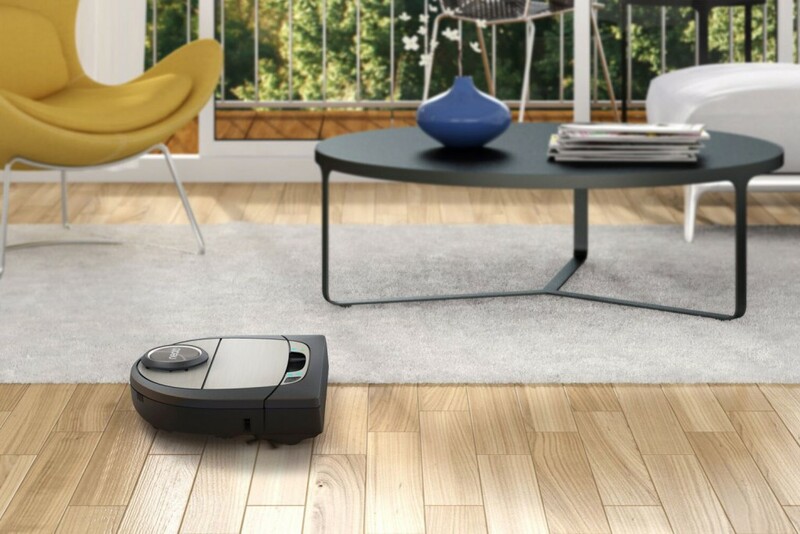 IKEA takes a considerable step forward by entering the market of smart devices. Most people that are devoted IKEA products consumers will like this improvement. Beside smart LED light bulbs, the light system includes LED light panels, LED doors, wireless dimmers, motion detectors, and a gateway and the IKEA Trådfri App for digital light control. If you are an IKEA admirer, you will be delighted with the possibilities it made for home lighting. Trådfri light bulbs are easy to install. All you have to do is to screw bulbs in, put a battery in the remote which is included in the package, and you’re set. 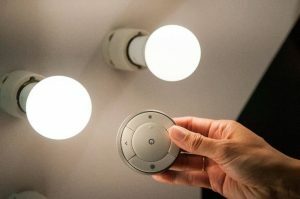 You can control up to 10 LED light panels, LED light doors or LED light bulbs using Trådfri remote. Another way of controlling Trådfri is to buy a hub and download an app, and you can control light bulbs through your phone, both Android and iOS. Trådfri smart light works well with voice control through Alexa, Google Assistant, and Siri. With the iHaus app, you can connect Trådfri smart light bulbs with your existing smart home devices. Trådfri smart light can be switched on and off combined with other smart devices such as Philips Hue, SONOS, Netatmo Elgato Eve, and many more in the iHaus Smart Home App. 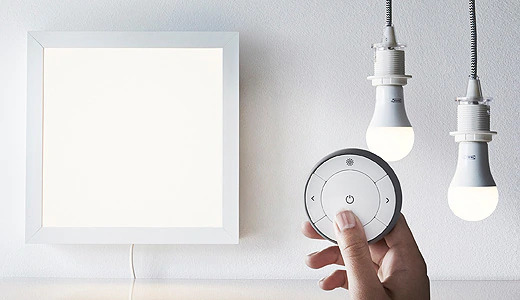 IKEA smart lighting products use the ZigBee Light Link standard to communicate with the rest of the smart home. This means it is well synchronised with a wide range of devices. LED light panels are an excellent choice in case that you don’t have enough natural light in the office or at home. Even if you work from home, you can adapt lighting to different activities – a brighter colder light for working and a warmer light for dinner. LIFX offers two excellent options of light bulb models Mini, which is the younger sibling of the A19 model. Considering the range of bulbs as well as third-party control support, LIFX Mini stands shoulder to shoulder with Philips Hue. Mini works well with Amazon Alexa, Apple Home and Google Home. And supports IFTTT and SmartThings. The app is available both for Android and iOS. Mini series bulbs are available in three types: warm white, temperature changing and RGB bulbs, each in bayonet and screw fittings. All bulbs have Wi-Fi integrated, so there is no need for a hub. 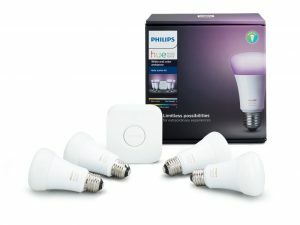 Regarding the price, LIFX is a bit more expensive than Philips Hue, but the price gets equal if you consider skipping the purchase of a hub. During the testing, bulbs performance was excellent, not to mention a couple of perks coming along with an app for LIFX. For example, you can define the speed on which lights will dimmer and eventually turn off, which is very convenient for children’s room. Different from Mini which is egg sized bulb there is an A19 model which has a flat bulb top and is pretty oversized for a bulb. The brightness of A19 is outstanding, and as the Mini, it is compatible with Amazon Echo, Google Home, or Apple HomePod. Other features are pretty similar to Mini, without some fancier ones but, with the much higher price, so this option would be better if you use the A19 for a single light, rather than for a whole home bulb replacement. The Lumos is one of the basic features LED bulbs that you can find on the market. Fortunately, all the present features work really well and communication with Alexa is excellent, and it doesn’t need a hub. EufyHome app on your Android or iOS is free, and you can command the bulb just as well from your mobile phone. 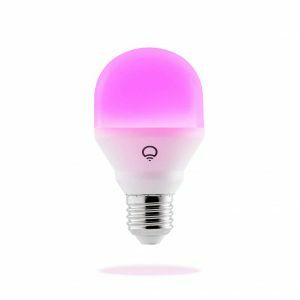 This bulb has no colour changing option, but for a small fee, you can get the temperature changing light, and considering its strength this is one of the brightest bulbs within its price category. 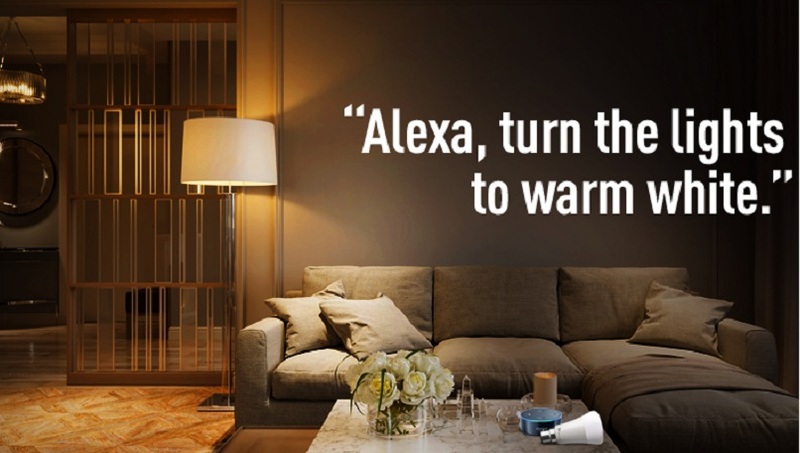 Dimming the bulb in range of 1 to 100 is easy and fast, and you can do it either by using your mobile app or Alexa. Installation and setup of the bulb are easy and later use as well. However, there are certain lacks of it, such as the short lifespan of 18 years if used 3 hours a day, and the size which is bigger than a usual bulb. Missing an interaction with other third-party devices but Alexa could also be a minus for this bulb. 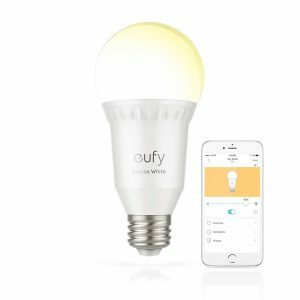 But if you want to have a simple and relatively affordable smart bulb to pair with Alexa in your home, Eufy Lumos LED is a good option. If you wish to read more about smart lighting solutions, check out our review for the best smart lights in this article.